Provide comfort for the family of Wilmer Gindlesperger with a meaningful gesture of sympathy. 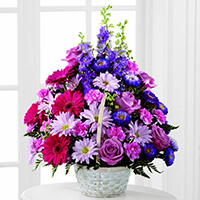 To send flowers in memory of Wilmer D. "Wimpy" Gindlesperger, please visit our Heartfelt Sympathies Store. We encourage you to share your most beloved memories of Wilmer here, so that the family and other loved ones can always see it. You can upload cherished photographs, or share your favorite stories, and can even comment on those shared by others. Mark - Our sincere condolences to you and your family. Apps Team & colleagues of Varian/Applied Materials purchased the The FTD Pastel Peace Basket for the family of Wilmer Gindlesperger. DEAR JOYCE AND FAMILY. WE WERE ALL SAD TO HEAR ABOUT '' WIMPY '' PASSING AWAY. PLEASE ACCEPT OUR SINCERE SYMPATHY. OUR THOUGHTS AND PRAYERS ARE WITH YOU ALL. WE HOPE YOUR DAYS ARE BRIGHTENED BY KNOWING OTHERS THINK OF YOU AND CARE. SINCERELY, MICKEY KOVALSKY AND DAVID AND CHERYL KOVALSKY. In loving memory of Uncle Wimpy, what a great gardener, and better person. He could even speak a bit of German with my wife. Don & Romy Miller purchased flowers for the family of Wilmer Gindlesperger.